Netbet offer 45/1 McGregor to win by KO against Mayweather! The bookmakers are growing in belief that 'The Notorious' will pull off one of the biggest sporting upsets of all time in August 26 and Netbet are offering a terrific 45/1 on McGregor to win by KO against Mayweather! What a price! The latest McGregor odds have the Irishman priced at around 7/2 BetVictor, but those looking for a much more lucrative return when backing the UFC lightweight champion have the opportunity thanks to Netbet Sportsbook! Fancy Conor McGregor to win by KO? 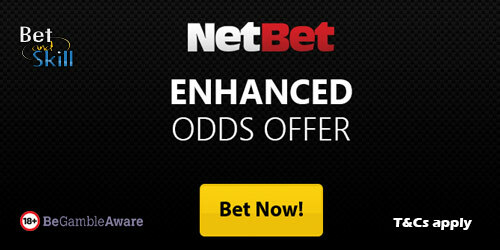 Get a HUGE 45/1 boost at Netbet! To claim the full winnings, enter the code "MCGREGOR" in the ‘Promotional Code’ area on the registration page. Place your FIRST BET up to a maximum of £1 (or to the same real value in an alternative currency), as a single bet on Conor McGregor to win by Knockout. This offer is for pre-match & single bets only, In-Play bets are excluded. Your Free Bet stake is not included in any winnings. You can use the Free Bet on all sports and markets at odds of 1/2 (1.5) or above. "Netbet offer 45/1 McGregor to win by KO against Mayweather!"